There's a multitude of factors that contribute to a divorce: your profession could prove critical in collapsing a marriage, as could settling down to appease your nagging family, especially if it's with the wrong person. But the national landscape of divorce varies state by state, as do things like obesity, education and just about everything in between. 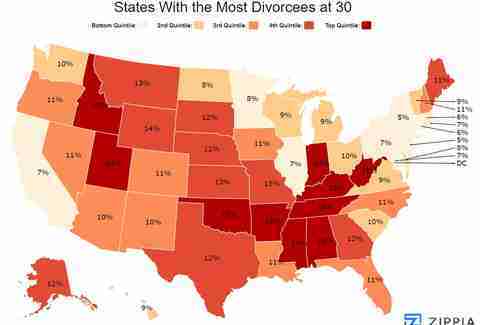 A new study from career guidance website Zippia explains which states have the highest and lowest rates of divorce for people under 30. Citing the most recent findings from the American Community Survey's PUMS data, Zippia was able to pinpoint the deep south as the region with the highest divorce rates for people in their 20s, although Idaho and West Virginia also have a high share of cratered marriages. When it comes to the brighter side of things, the northeast provides the most favorable ratings for people looking to stay happily wedded past their young and naive twenties. Of course, the data sample only reflects a small subset of young people who probably haven't been married very long. According to the American Psychological Association, between 40-50% of American couples eventually get divorced, and the majority of people do so before the end of their third decade. So, consider this a cue to enjoy your twenties and to take your time. As many '90s rom-coms can attest, rushing into the nominally life-long endeavor of marriage is usually a bad call.